Feel like you could be doing more to make a positive impact on your business? and development decisions? We are here to help! that will enable you to make hiring and development decisions with confidence. Customized professional services for employee development that align with your organization’s strategic vision. View our leadership development programs and stop by our booth #3140 to learn more! Embed critical thinking into your company culture with the world's leading critical thinking assessment. 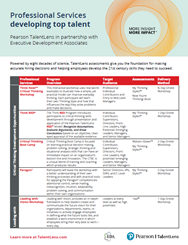 Learn more about this higher-order 21st century skill and its important link to job performance. Interested in learning more about TalentLens? Complete this form and we will get in touch with more information. Powered by assessments that are rooted in decades of research, and professional services that align with your strategic objectives, TalentLens gives you the foundation for making accurate hiring decisions and helping employees develop the 21st century skills they need to succeed. Visit US.TalentLens.com to learn more!